The cover of the forthcoming New Yorker magazine invokes a familiar image: a blonde woman in a nightgown reacts in terror to the sight of a giant face at her window. It’s Fay Wray and King Kong, of course, but with a twist: the giant eyeball peering in at her belongs not to a gorilla, but to Uncle Sam, while her laptop and the cellphone into which she is shouting in panic identify the current references: revelations that the powers given to the government to protect us from terror have, in fact, been turned on us in ways that threaten our liberties. The cover of the magazine is, in effect, a large, full-color, editorial cartoon—a medium that combines the representative and narrative powers of graphic arts with the essayist ability to present facts and argue them at the same time. Some who see the cover will be offended that it makes light of something they consider too serious to laugh about. Others will accuse the artist, Richard McGuire, of overstating the adversarial relationship between government and law-abiding citizens. What no one can deny, however, is that this single image renders visible, in almost diagrammatic form, argument that has been brewing in this country for most of a decade. To the editorial cartoonist falls the task of boiling down current events, even as they are still taking shape, all the while making visible ironies and altering the apparent importance of noted and overlooked facts. Two of the most readily recognized of these paragons are local hero Pat Bagley, cartoonist for The Salt Lake Tribune, and Baltimore’s Kevin Kallaugher, better known as KAL, whose cartoons appear in London’s The Economist and in his local paper, The Baltimore Sun. On Tuesday, Bagley will introduce Kallaugher in the midst of Ken Sanders’ enormous collection of graphic ephemera, where his new book of KAL cartoons, “Dagger’s Drawn,” should fit right in. 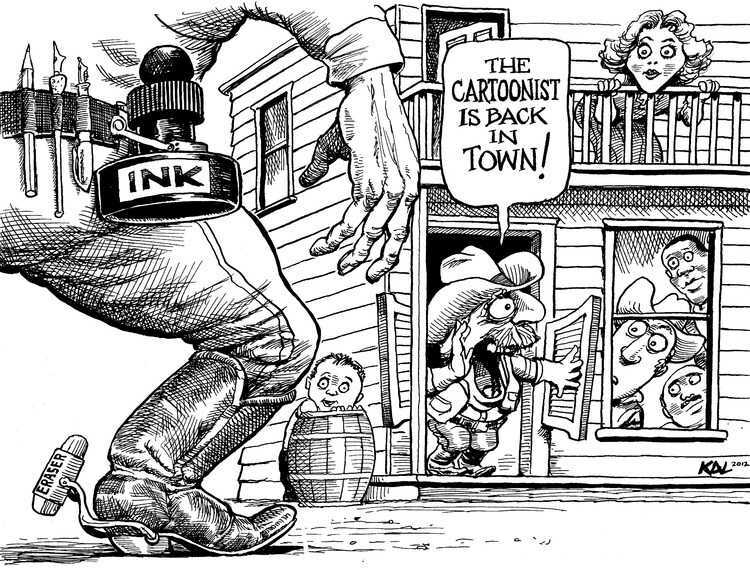 After 35 years, thousands of cartoons and over a hundred magazine covers, KAL’s distinctive style of caricature and pomposity-skewering compositions should be familiar to every reader, even if they don’t know his name. In order not to prejudice anyone who might take offense at seeing a particular politician held up to ridicule, here’s one where the cartoonist turns his flair for delusion deflation on himself. This event is free and open to the public, and will be held Tuesday, June 25th at 7:00 pm at the downtown location of Ken Sanders Rare Books: 268 South 200 East.